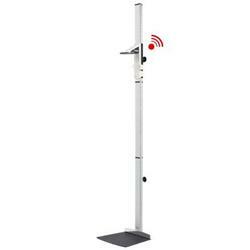 seca added value: A wireless stadiometer that can send its measurements to a PC? There is such a thing – from seca of course: the digital stadiometer seca 274 (free-standing) and seca 264 (for wall mounting). Both transmit the measured height with the help of the newest seca 360° wireless technology to your PC, where the data are analysed by the software seca analytics 105. From there they can also be transmitted to an Electronic Medical Record (EMR) system. With the seca 456 you equip your PC to receive wireless data from seca scales and measuring instruments. You can eliminate annoying cable connections in the examination rooms and, with software seca analytics 105, you can store measurements in the seca database, feed them into an EMR system and provide other parameters per PDF (EMR-integrated). The labor-intensive process of documenting examination findings is turned into a speedy and paperless matter. The seca 465 wireless 360 printer dose more than print – It also assist in making a diagnosis. The measurements made by seca 360° wireless scales and height measuring rods are transmitted directly to the seca 360° wireless printers for immediate printing. The technology saves time and presents options for further analysis. For example, the printers simultaneously calculate values such as total energy consumption and compare them to reference data to see whether the result falls within the normal range. You can print out the answer in black and white. Upon request, you can add the logo used by the hospital or doctor’s practice to the print-out. The seca 465 thermal printer is exactly the right partner for wireless scales and measuring rods by seca. Via its wireless receiver and pre-configured SD smart card, the printer receives the measurements transmitted by seca devices and analyzes the data. In the process the printer compares height and weight to reference values from WHO, CDC and Kromeyer-Hauschild et al., and ascertains percentiles for children. Resting metabolic rate and total energy consumption based on parameters of gender, age and PAL (Physical Activity Level) are also calculated. As needed, Body Fat Rate (BFR) can be analyzed and printed. The user has only to enter the patient’s gender and press a key to calculate BMI. The seca 466 wireless 360 printer dose more than print – It also assist in making a diagnosis. The measurements made by seca 360° wireless scales and height measuring rods are transmitted directly to the seca 360° wireless printers for immediate printing. The technology saves time and presents options for further analysis. For example, the printers simultaneously calculate values such as total energy consumption and compare them to reference data to see whether the result falls within the normal range. You can print out the answer in black and white. Upon request, you can add the logo used by the hospital or doctor’s practice to the print-out. The seca 466 thermal printer is exactly the right partner for wireless scales and measuring rods by seca. Via its wireless receiver and pre-configured SD smart card, the printer receives the measurements transmitted by seca devices and analyzes the data. In the process the printer compares height and weight to reference values from WHO, CDC and Kromeyer-Hauschild et al., and ascertains percentiles for children. Resting metabolic rate and total energy consumption based on parameters of gender, age and PAL (Physical Activity Level) are also calculated. As needed, Body Fat Rate (BFR) can be analyzed and printed. The user has only to enter the patient’s gender and press a key to calculate BMI. 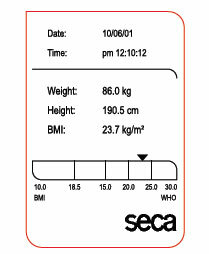 Seca 4860001009 Thermal labels for Seca 4661 Roll (450 Lables). 50 rolls of Thermal Paper for Seca 360° wireless printers Seca 466 and seca 465.